There are 90,107 government units in the U.S. — everything from county governments (3,031) to independent school district governments (12,880), according to 2012 Census Bureau data. Some governments have appointed officials, but hundreds of thousands of Americans serve in elected office, mostly at the local level. For the first time, Pew Research asked a question about who seeks out these offices and found that about 2% of Americans say they have ever run for federal, local, or state elected office. With the data from this year’s polarization survey and political typology, we can provide a snapshot of who has ever placed their name on a ballot, although we don’t know how recently they did so. 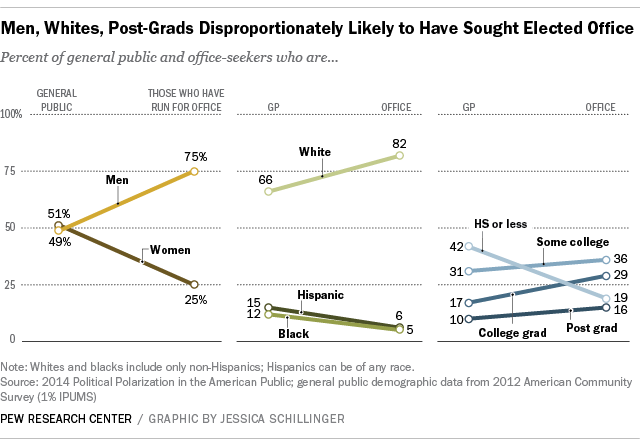 Our data show that those who say they have sought office tend to be white, male and well-educated. In fact, while women account for half of the adult population, they are just a quarter of those who say they have run for office. This is in keeping with other research that has documented the imbalance. Women who serve in office continue to be underrepresented at all levels of government — 20% of U.S. senators are women, as are 18% of House members; at the state level, only 10% of governors and 24% of state legislators are women. There is a similar imbalance when it comes to race and ethnicity, with whites disproportionately more likely to have sought office and blacks and Hispanics less likely to have done so. While non-Hispanic whites make up 66% of American adults, according to the U.S. Census Bureau’s 2012 American Community Survey, 82% of those who say they have ever run for office are white. By contrast, non-Hispanic blacks make up 12% of the adult population but only 5% of office-seekers. Similarly, 15% of U.S. adults are Hispanic while only 6% of the adults who have ever run for office are Hispanic. Moreover, 16% of those who say they have run for office have post-graduate degrees; only 10% of the total adult population has attained that level of education. In addition to having run for office, this group also participates more in other political activities. For example, while 15% of all U.S. adults say they have made a donation in the last two years to a political campaign or group that supports a candidate for office, 35% of office-seekers have donated money in that time. One caveat is that our question asks about a lifetime history of running for office and does not provide a snapshot of who currently is running for office. Thus, 43% of adults who have ever run for office are ages 65 and older, while the age profile of candidates today might be different. Methodological note: The survey question was asked of 3,341 adults, Jan. 23-Feb. 9, 2014, with a margin of error of 2.0 percentage points. A total of 112 people, or 2% of the weighted sample, said they have ever run for office.